The Georgia Southern Mock Mediation Club recently competed at the International Intercollegiate Mediation in Des Moines, Iowa, winning a total of six awards, including ranking in the top 10 in mediation and advocacy in the world and fourth in all World Advocate awards. 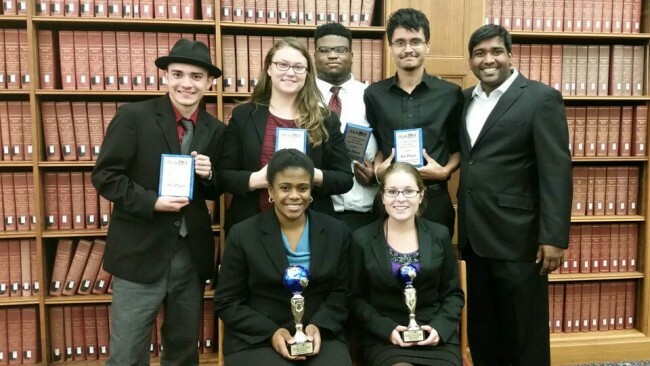 This semester, the Club also has received other awards including several at the Georgia State Conflict Resolution Symposium and the Regional Mediation Tournament hosted by Brenau University. While in Des Moines, the students proved not only that they were successful at the international level, but also they had the opportunity to attend the Mediator’s World Congress where a diverse array of professionals discussed topics such as mediation in the Muslim world, restorative justice and compassionate mediation. In addition, while at the international competition, Jessica Shanken, president of the Mock Mediation Club, announced that Georgia Southern will host an Invitational Mediation Tournament April 8- 9 for all student organizations who would like to better understand conflict management and effective communication. Prior to the International Intercollegiate Mediation competition, the team placed first in both the undergraduate and graduate divisions at the Georgia State Conflict Resolution Symposium. The club sent four teams, three undergraduate squads and one graduate team, to the symposium. In the undergraduate division the Club placed first in both mediation and advocacy, and in the graduate division, the club placed first in mediation. “While this was mostly an opportunity for students in the region to learn from each other and the amazing speakers, Mock Mediation fared very well during the competition,” said Shanken. The Club received eight awards during two days of competition in October at the Regional Meditation Tournament, hosted by Brenau University, in Gainesville, Georgia. Awards included four top 20 advocate awards, two top 10 individual mediator awards, a top six team in the advocate/client team category award, and a top six in the mediation team category. The tournament hosted its largest field in its 13-year history with a total of 26 teams traveling from as far as Ohio and Texas. Across the board, the Georgia Southern Mock Mediation Club ranked in both advocacy and mediation. Having received more than 50 awards since its founding in fall 2013, members of the student-led Club have also gained valuable experience through competition. Students have been able to learn firsthand the value of communication, professionalism and collaboration. The College of Liberal Arts and Social Sciences (CLASS) is the largest of the eight colleges that make up Georgia Southern University, and it plays a central role in every student’s core of knowledge. CLASS, also described University’s College of the Creative Mind, prepares students to achieve academic excellence, develop their analytic skills, enhance their creativity and embrace their responsibilities as citizens of their communities, their nations and the world. CLASS offers more than 20 undergraduate degrees and several interdisciplinary minors from its 11 departments and five academic centers. CLASS offers eight master’s degrees, two graduate certificates and one doctoral degree. For more information, visit GeorgiaSouthern.edu/CLASS.